Have you heard of the master-mind duo Bonnie & Clyde? Find out more about them in the hot board game Bonnie & Clyde. Your goal in this fun game is to make "melds" which are also known as 3 or more of a kind. However, another set of cards are going to be used against you to add some strategy to this game of chance. Your goal in Bonnie & Clyde is to score points, the more points you score, the closer you'll be to winning this exciting game. Try your luck and planning in this fun game of Bonnie & Clyde. Bonnie & Clyde will have you working harder to win than you might have thought possible. Check out Bonnie & Clyde today! 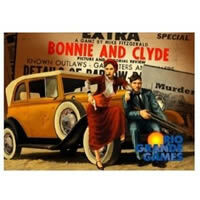 See the Bonnie and Clyde game rules and instructions. Please keep in mind that the official Bonnie & Clyde board game rules and instructions could be different depending on the game version you have. The rules below are some of the exact directions on how to play Bonnie & Clyde. Share with us your comments, funny stories, tips, advice, strategies, creative ways to play, questions about how to play, problems with the rules or anything you want about Bonnie & Clyde. All submissions will be reviewed within 24 hours. Click here to add your Bonnie & Clyde comments.